In 2010, a research team garnered attention when it published evidence of finding the first animals living in permanently anoxic conditions at the bottom of the sea. But a new study, led by scientists at the Woods Hole Oceanographic Institution (WHOI), raises doubts. One alternative scenario is that cadavers of multicellular organisms were inhabited by bacteria capable of living in anoxic conditions, and these “bodysnatchers” made it seem that the dead animals were living, said Joan Bernhard, a geobiologist with WHOI and the lead author of the new study published in the December 2015 issue of the scientific journal BMC Biology. 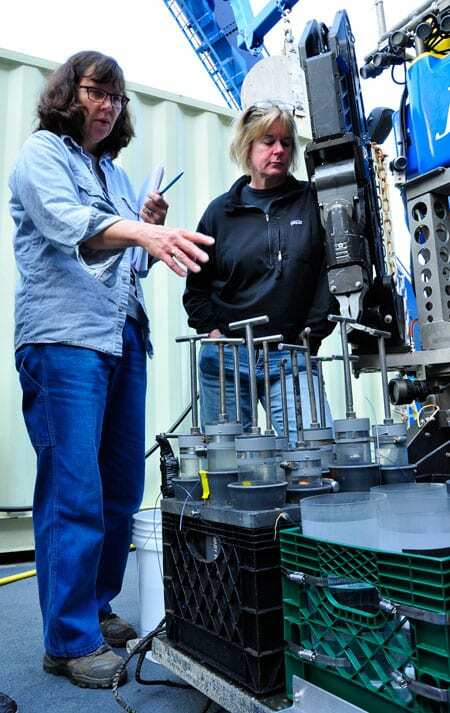 Bernhard and Virginia Edgcomb, her colleague at WHOI, led an expedition in 2011 that returned to the site of the initial findings: a deep hypersaline anoxic basin (or DHAB) two miles deep in the Mediterranean Sea. DHABs are curious phenomena. They exist in depressions on the seafloor, where long-buried salt deposits become exposed to seawater and dissolve into the sea. The hypersaline water is extremely dense and remains separated, like oil and water, from surrounding normal seawater. It forms “lakes” on the seafloor, tens to hundreds of meters deep, that are extremely salty and devoid of oxygen. In the 2010 study published in the same journal, researchers from Polytechnic University of Marche and the Natural History Museum of Denmark, led by Roberto Danovaro, analyzed samples collected from a Mediterranean DHAB called L’Atalante. They reported finding multicellular animals (or metazoans), including previously unknown species of a type of tiny animals called loriciferans. The contrast between conditions at the seafloor and at the surface makes it nearly impossible to recover live specimens, and so in the past, metazoan specimens collected from DHABs have been “interpreted as the result of a rain of cadavers that sunk to the anoxic zone from adjacent oxygenated areas,” according to the Danovaro study. But the scientists conducted experiments with fluorescent tags, taken up only by metabolically active organisms, which gave indications that the loriciferans had been alive. In addition, a few loriciferans appeared to have reproductive structures called oocytes (or eggs), indicating that the organisms were reproducing. Intrigued by these findings, Bernhard and Edgcomb returned to L’Atalante and other nearby DHABs in 2011 to further investigate aboard the research vessel Atlantis. They collected sediment and water from the edges of three brine pools with different chemical compositions, using WHOI’s remotely operated vehicle Jason to visually guide carefully targeted push-core samples. 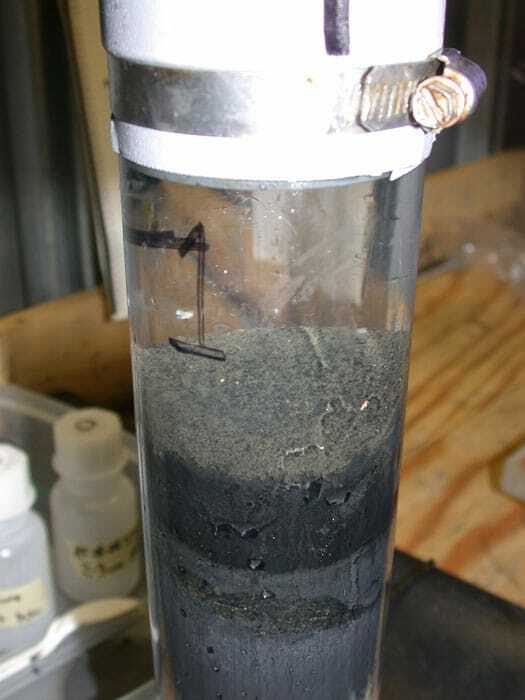 Samples were taken from points in the upper, middle, and lower levels of the layer of water immediately overlying the brine lake. This so-called “interface zone” is where normal seawater at the top transitions to the brine at the bottom, becoming more concentrated and anoxic the closer to the brine. The highly dense, saline, chemical-laden and oxygen-depleted water in all three pools was too dense for Jason to fully penetrate. Control samples from nearby sediment and water of normal oxygen and salinity were also collected. In some control samples, which were mud and water of normal oxygen levels, and also in some samples from the upper level of the interface zones, which have a low level of oxygen, Bernhard and colleagues found the same loriciferan species from L’Atalante reported by Danovaro and colleagues in the 2010 paper and formally named in a 2014 publication. Bernhard et al found the greatest number of metazoans were nematode worms, with much smaller numbers of bryozoans, crustaceans, and loriciferans, including the same three loriciferan genera Danovaro and colleagues reported. More metazoans were in the upper layer and far fewer in the middle and lower layers of the interface zone. The WHOI-led team used a combination of techniques (including incubation with a marker of living tissue, ribosomal RNA sequencing to identify species, epifluorescence imagery, differential interference and phase contrast imagery, and ultrastructural examination of individual specimens, and more) to examine the metazoans collected in the samples. The team’s results provided evidence that some nematodes were alive in both the normal sediment and the upper level of the interface zones. But in the lower interface, with almost no oxygen, the metazoans seen were degraded or only their outer coverings, called cuticles. “We found no evidence that these metazoans were living or reproducing in the deepest part of the interface,” Bernhard said. 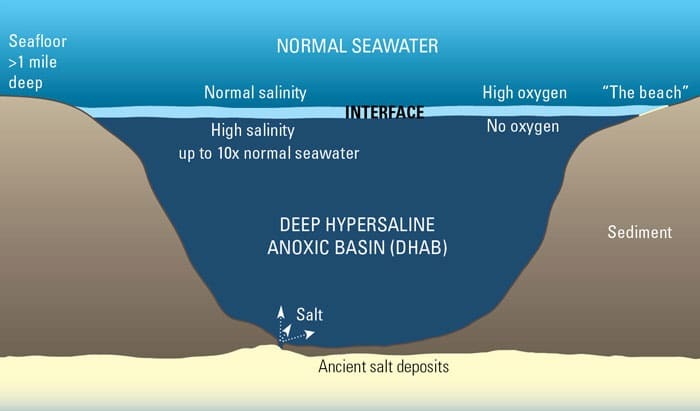 They argue that it is very unlikely that the same loriciferan species that they found in normal (control) sediment would also be physiologically able live in the two very different hypersaline, hyperdense, hyper-chemical brine pools where they were collected, because the range of conditions is too wide to adapt to. “The possibility of a viable metazoan community in brines of DHABs is not supported by our data at this time,” the authors wrote in their new paper. Authors of the paper were Joan M. Bernhard, Colin R. Morrison (U Nevada Reno), Ellen Pape (Marine Biology Research Group, Ghent University), David J. Beaudoin (WHOI), M. Antonio Todaro (U Modena & Reggio Emilia, Modena, Italy), Maria G. Pachiadaki (WHOI), Konstantinos Ar Kormas (Dept of Ichthyology & Aquatic Environment, School of Agricultural Sciences, U Thessaly, Volos, Greece), and Virginia P. Edgcomb.